So the lieutenant governor resigned. Now what? The news of Lt. Gov. 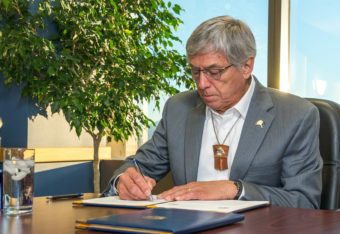 Byron Mallott’s resignation Tuesday had a lot of people wondering what will happen next. And that includes Matt Buxton, who is the editor of the online blog Midnight Sun. He also covered the legislature for the Fairbanks Daily News-Miner during the Walker-Mallott administration. Buxton spoke with Alaska Public Media’s Casey Grove. BUXTON: Hi. How’s it going? GROVE: Well, it’s just kind of surprised and you know, I wanted to ask you that first to what was your reaction to the news today? BUXTON: I mean, I was shocked, you know, nobody saw this coming, you know, a lot of these things you might hear about some rumblings or something like that, but this is out of the blue. GROVE: Yeah, we’re three weeks away from the election and just, that aside, when you consider the relationship that the governor and lieutenant governor kind of portrayed that they had, how does this seem to indicate some some huge blow up between the two of them? BUXTON: I mean that’s that is that’s the next step with a lot of this questions’ because you know, I think a lot of us are going to be wondering about what exactly happened with this, the implications for the state’s office and everything like that, but Byron Mallot and Bill Walker, you know, made their election in 2014 off of the unity ticket. They merged, they basically, as they would tell it, you know, they were best friends, you know, that was kind of an almost unusual for the governor and lieutenant governor to be so close. And so it’s when you look at how this plays out over the election, I’ve been thinking about this over the last, hour I don’t know our since it broke, hour and a half. It really does tarnish Walker’s bid. Him and Byron have had like a bromance for these last four years, and it’s really hard to see how Walker and his administration and his campaign can can walk away from this. There’s no margin for error in this election right now. GROVE: Remind us how Gov. Walker and Byron Mallott became running mates to begin with? BUXTON: Right now, we’re in a three-way election right now for this for this year. That was the same thing in 2014. You had incumbent Republican Gov. Sean Parnell, and then you had the Democratic ticket of Byron Mallott and Hollis French and the independent ticket of then-Republican Bill Walker and his running mate, Mr. (Craig) Fleener. There’s a deadline basically for when parties can change their tickets and rewrite them and how that everything like that before the ballots get printed. A couple days before that happened, they announced that — surprise — that they were going to merge their campaigns and you know that proved to be really winning strategy. You had kind of a moderate conservative on the top of the ticket with with Walker and you had the Democratic party coming along with Mallott as lieutenant governor, and they were able to kind of sweep into the election at that point. So they ran together and they seemed to be very good friends. GROVE: Yeah, and they talked about that. Like you said, they had this close relationship. Politically, though, after this announcement today, the governor hasn’t really said what it means for his political future and exactly what it means for the campaign. And you know, you’re going through the possibilities in your head. What are some of those what are the different ways that this could go? BUXTON: Well, we’re talking about the outcomes of this right. So at this time point in time Department of Health and Social Services Commissioner Valerie Davidson has been sworn in as lieutenant governor. The campaign is put out an announcement– The Walker campaign has put out an announcement saying that, though Byron Mallot will stay on the ticket, because the ballots have already been printed and some people have already voted, that Valerie Davidson will take over that role, you know, she will if this ticket, you know, I guess at this point somehow prevails Valerie Davidson would take over as lieutenant governor. So I say “somehow,” because I think that they’re in a lot of trouble right now. I think it’s gonna be really hard to distance yourself from whatever allegations there are. There’s not a whole lot of detail on that, so I think you’ll see a lot of the press, as much as I kind of don’t like it, will start to dig in try to figure out exactly what was said, and what happened there. And so this this story will continue to kind of slow burn over the next couple weeks at least, and so the Walker campaign’s in a lot of trouble right now. I have heard, you know, people talk about the possibility of the Walker campaign potentially withdrawing. Whatever happens at this point, they’ll be on the ticket, they’ll be on the ballot, so if anything like that it would be a symbolic thing. GROVE: But even if he decides to withdraw at this point, I mean, like you said his names on the ballot, how do you even withdraw at this point three weeks before the election? BUXTON Well, they put all their money that they have raised into getting the message out there, because they’ll be on the ballot one way or another. The way that would play out — and I’ve seen this happen a few times and local races and it never really works — but, you know, you put all your energy and effort into saying, going getting out there and getting in front of people and saying, “I support this other candidate, … if you support me and support what I am doing or supported my candidacy, I now support this other guy.” But again this is going to be a race with really small margins for error, and so whether or not that actually happens is one question … If it does and if you know, it’s going to be amazing, I guess, if it’s somehow succeeds and sending enough of those votes over.